Makino, Mason, OH, introduces the newest addition to its family of five-axis vertical machining centers, the D800Z. Joining the Makino D-Series (D300 and D500), the D800Z is designed for high-performance job shops, precision parts machining, die/mold and aerospace applications. 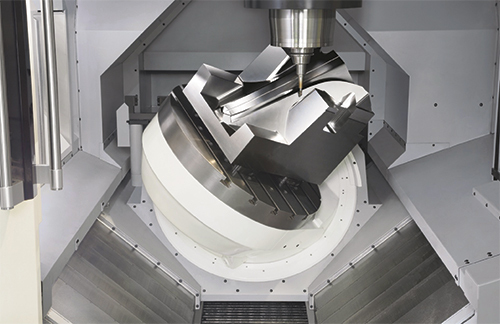 Like the other two D-Series machines, the D800Z offers easy access to the spindle and table, a highly rigid structure for responsive cutting and good surface finishes. Load it up with workpieces as large as 1000-mm dia., weighing as much as 1200 kg. Use the five-axis capability of the machine in five-face milling mode to minimize setup, optimize access to complex multisided parts and reduce cycle times; or to address the demanding angular, blending, matching, fine-surface finishes and 3D accuracy requirements of die components. Feed rates tops out at 36,000 mm/min. on the X, Y and Z axes, and 18,000 deg./min. (50 RPM) on the B and X axes.